During his first State of the Union speech in 1964, U.S. President Lyndon B. Johnson delivered a message to America. His goal was clear: To eradicate poverty in America. However, a new report released this week shows that the number of Americans living in poverty is at the highest level since the mid-1960’s. After 48 years of failed policies and over $15 trillion of taxpayer money spent, America’s war on poverty has been an absolute disaster. Today, nearly 50 million Americans are living below the poverty income line. That’s one out of every six Americans. How is the poverty line defined? The government defines a family of four that earns less than $23,000 per year as living below the poverty line. Sadly, 20% of America’s children live in homes that are considered to be at or below the poverty line and over 1 million U.S. public school students are homeless. Never before in our nation’s history have more Americans been utterly dependent upon assistance of the Federal government. Many Americans have become virtually addicted to cradle-to-grave care from the government. Today over 128 million Americans receive money from the government each month. According to a well documented study released by the Heritage Foundation, over 128 million Americans – or 41% of the American population – receive some form of financial assistance from the federal government every single month. For example, today nearly 50 million Americans receive food stamps. That’s up from 17 million Americans just 12 years ago. Another 9 million Americans today are collecting federal disability payments. That’s more than three times as many Americans living in the city of Chicago! And that number has risen every single month since January 1997. And don’t expect things to improve anytime soon. The Federal government continues to adopt tragically flawed policies that stifle economic growth and inhibit innovation and ingenuity. These inept policies coming out of Washington have crippled the U.S. economy and have led to a drastic increase in unemployment levels and a decrease in personal incomes across the nation for those who still have a job. And let’s not forget to mention that the Federal government is bankrupt. 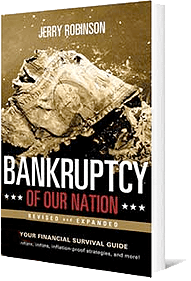 With over $16 trillion in current debt and over $120 trillion in future unfunded obligations to our nation’s citizens, the Federal government is in big financial trouble. There is no doubt that the United States is going to continue suffering a terrible economic decline in the months and years ahead. The only way to protect yourself from the coming collapse of the U.S. government is to begin making a plan and preparing now. Our organization has created a free online financial guide for you called the Five Levels of Financial Freedom. You can begin reading it right now on at FTMDaily.com/fivelevels. The collapse that is going to strike America will be severe, sustained, and devastating to millions of people. You don’t have to be one of them. 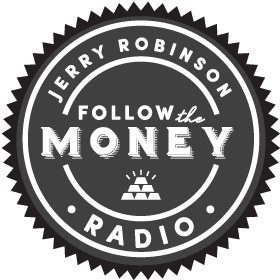 And stay tuned to Follow the Money radio. We will be here to keep you informed as we rush headlong into the greatest economic shift in world history.